Photo courtesy of Ayesha Mir/Express. On Education Day [8 January 2017], a demonstration in the province of Sindh has called for steps to reform the education system with better facilities and increased opportunities for all children. Participants highlighted the need for better attendance monitoring and the promotion of girls’ education, among others. Strengthening the education system in the region would help curb poverty, which plights large parts of the population of Sindh. In order to better raise the question of Education, civil society and parliamentarians declared 2017 to be the Year of Education. 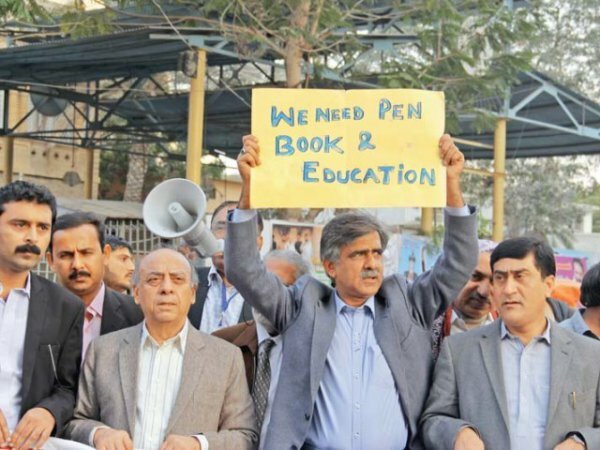 ‘Taleem Sudhario, Sindh Sanvario [Save Education, Save Sindh]’ was the slogan that participants shouted as they marched from Karachi Press Club to the Sindh Assembly building on Sunday to observe ‘Education Day’. Similar activities were carried out in Hyderabad and Sukkur. To speak about issues pertaining to education in the province, NGOs, civil society, parliamentarians and social activists came together and decided to observe 2017 as the year of education. Talking to The Express Tribune, the participants of the march in Karachi said that people from different walks of life have established a forum, called ‘Save Education, Save Sindh’. The walk was carried out to mark the first day of the ‘Education Year’. “We will be doing different programmes, seminars, workshops and meetings throughout the year to save education, [which is] deteriorating in the province,” said a member of Save Education, Save Sindh, Aajiz Jamali. According to him, it was the first time that Education Day was celebrated or organised in Sindh. The demonstrators demanded the appointment of headmasters in schools, giving priority to merit in job opportunities and curbing feudal influence in schools in rural areas. The reason behind this step is to spread awareness for education of children and making the lawmakers realise the importance of learning and training, explained Jamali. Talking about the march, he said that it was symbolic and the purpose was to make parliamentarians realise that it is their responsibility to provide good quality education. “We have planned to conduct a national education conference in March to highlight the need and to make our society understand how backward we have been in terms of education system,” said Jamali, adding that other than conferences, they will make sure that the government ensures the provision of missing facilities in schools. After marching to the assembly, the participants sat on the road to record a peaceful protest. Addressing the protestors, Primary Teachers Association’s president, Intizar Hussain, said that the ministers, secretaries or any other officials do not take education as a serious matter and hence ignore the issues pertaining to education in the province. “In the last five years, no decision has been worked out for education in schools while a majority of the schools do not have basic facilities including water, toilet, furniture, boundary wall and electricity,” he said. Pakistan Muslim League-Nawaz MPA Soorath Thebo, who was also among the demonstrators, said that the state of education in Sindh is deteriorating day by day. “There is nothing left as basic education in Sindh while our children are getting deprived of their right of acquiring free and [good] quality education,” she said, adding that she had approached the ministers and secretaries to work for education but no action has been taken to cope with the menace. Members of the Awami Jamhoori Party also participated in the march. Educationists and representatives of NGOs reiterated their demands of improving public-sector education in Sindh in the rallies taken out on Sunday in different districts to mark Education Day. The demonstrations were organised in Hyderabad, Mirpurkhas, Nawabshah, Jamshoro, Sanghar, Badin, Thatta, Tando Allahyar, Umerkot and other districts. Participants called for reopening the closed schools, ensuring teachers’ and students’ attendance, promoting female education, rehabilitating and building new infrastructure of schools and colleges and curbing the menace of cheating in exams among other measures. At a rally in Hyderabad, the demonstrators asked the government to make a rule that compels the elected representatives and government officials to enrol their children in government schools. Different NGOs and civil society activists also observed Education Day throughout Upper Sindh on Sunday. Rallies were staged in different parts of Sukkur, Khairpur, Shikarpur, Jacobabad, Kashmore, Larkana and others. In Sukkur, a rally was organised by Health and Nutrition Development Society (HANDS) and other members of civil society, which began from Mohammad Bin Qasim Park and culminated at Dolphin Chowk at Minara Road. Speakers highlighting the importance of education urged upon the government and people to ensure the enrolment of all out-of-school children. They also urged to improve education in government schools and appealed to teachers to discharge their duties with utmost honesty and dedication.